We have been dedicating to the sale of trulli and to the promotion of Itria Valley for more than 35 years. We are headquartered in Cisternino and we are the main real estate agency which promotes the masterpieces of Itria Valley both in Italy and abroad. 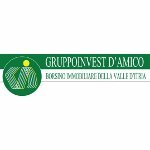 The GRUPPOINVEST D'AMICO is the leading group which purchases or rents out trulli, stone houses in the old town centre and manor farms in the towns of Cisternino, Ostuni, Martina Franca, Locorotondo, Alberobello, Ceglie Messapica, Torre Canne e Selva di Fasano. In the agency GRUPPOINVEST D'AMICO you will meet experts people who will definitely follow you in order to satisfy your needs by offering you real solutions. GRUPPOINVEST D'AMICO contributes to the promotion of the historical-natural beauties of the Itria Valley! In addition, we do want to create a big tourist interest stimulating future investments in Apulia.